Desire to protect the poor left Brazil’s driest city few options other than new pipes and prayers for rain. Sao Paulo’s Cantareira reservoirs, which supply half of the city’s 20 million people, are just 12 percent full.Click image to enlarge. In lieu of water rationing, Brazil’s largest city has decided to manage its severe drought by spending millions to tap the deepest pools of its drained reservoirs. The risky move has put leaders of one of the world’s largest water utilities under a global media microscope, and invited harsh criticism from some hydrologists and politicians. SABESP, Sao Paulo’s water utility that serves 20 million residents, chose to extend its water-intake pipes into the city’s Cantareira reservoir system to tap the water at the very bottom of the reservoirs twice over the last six months. The first extension cost $US 80 million and boosted the reservoir system above 26 percent of its capacity in May. The second extension, completed in October, raised water production to 13 percent of capacity after it had dipped as low as 3 percent. The utility’s executives contend that their decision to drain the deepest regions of the Cantareira reservoirs will avoid hurting the poorest and most vulnerable groups and will ensure enough water until March 2015. By then, they say, seasonal rains will refill the city’s freshwater reserves — though conservation efforts will still be needed. But critics call the drought-management strategy irresponsible, dangerous, and politically motivated. The reason is the outsize risk not only to Sao Paulo but also to the rest of the country if the drought continues and the region’s water supply collapses. 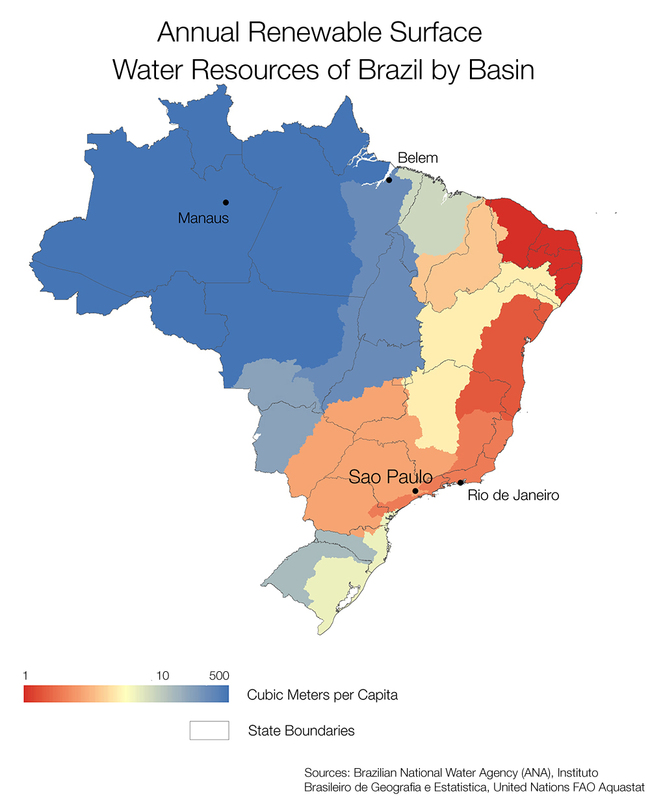 Brazil as a whole has some of the most abundant freshwater resources in the world, but many of its population centers are located in regions where there is less water availability. Click image to enlarge. Sao Paulo’s water managers and the city’s residents, in effect, are embroiled in a high-stakes challenge to delay or entirely evade the most calamitous threat, namely running out of water. The outcome is being widely watched by dry cities around the world – from Los Angeles to Beijing, from Doha to Melbourne – which seek lessons in managing water supplies in an era of hydrological disruption and diminishing moisture. The central concern in Brazil, of course, is whether SABESP’s investment in new pipes and conservation incentives – and not in a rationing plan – will work. 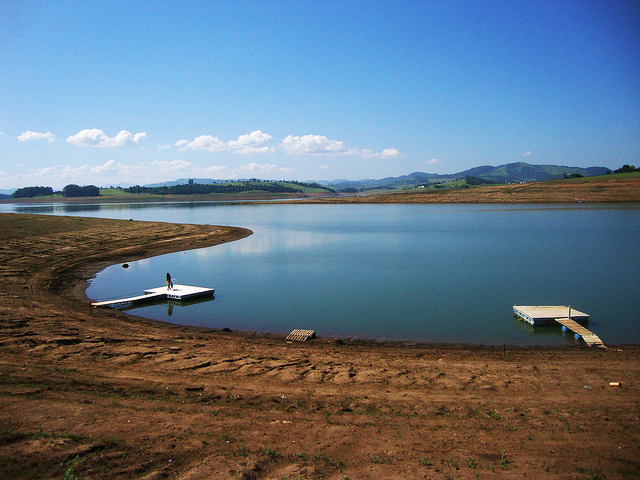 Situated in a nation that typically enjoys one of the most abundant freshwater supplies on Earth, Sao Paulo has quickly become desperately dry. The drinking water system that supplies half of Sao Paulo’s growing population is now 12 percent full after nearly a year of record-setting drought and could have less than 100 days of water in reserve. NASA satellite images show the shriveled Cantareira reservoirs, which dipped to 3 percent capacity on October 23, as shallow and green, ringed by expanses of brown lake bottom. Aside from drinking and bathing, the drought has other far-reaching effects — hydropower reservoirs, which supply more than 75 percent of Brazil’s electricity, are running critically low in the country’s southeast region, and this could prompt energy rationing next year, according to Bloomberg News. Global soybean prices rose 12 percent in October based on speculation that the summer harvest in Brazil, the world’s second-largest soybean exporter, will be hit by the drought. Sao Paulo’s water utility, SABESP, is not officially rationing water but is offering residents discounts to conserve water. Click image to enlarge. Sao Paulo’s plight has two causes. The first is a 13-month drought, the deepest in 80 years. The second is an urban water system that was designed for a nation of water abundance. Despite having one of the largest water-supply systems in the world, Sao Paulo’s enormous population leaves the city with very little buffer to accommodate shocks of this magnitude. As climate change, deforestation of key watersheds, and population growth put even more stress on the system, engineers and water managers will need to reassess the way that the city supplies and uses its water, according to experts like Porto. Sao Paulo is not alone. Even without taking climate change into account, 45 percent of cities that rely on rivers and reservoirs for their water will be vulnerable to shortages and scarcity by 2040 due to increased agricultural and urban demands, according to a study of 71 global cities published by Stanford University researchers in October. Rainfall totals in Sao Paulo this year are approximately half of what they normally are by November, according to Brazil’s Center for Weather Forecasting and Climate Studies. The region, which receives nearly 80 percent of its annual rainfall between January and March, is entering its summer rainy season. Still, even an average rainy season will not solve Sao Paulo’s water problems completely. Rationing in the city, however, is both technically difficult and socially harmful, she added. It would require many different steps to physically turn off pipelines and stop and start water across Sao Paulo’s vast distribution system, which delivers water from 28 water treatment plants to a metropolitan region that stretches across more than 2,000 square kilometers (772 square miles) — twice the area of New York City. Furthermore, the poorest neighborhoods are located on the outskirts of the city, meaning these areas would lose water first and regain it last if the system were shut down, according to Porto. In the meantime, SABESP has taken a number of measures to preserve water supply and reduce water use, according to Bittencourt. For example, the utility has supplemented the Cantareira reservoir system with water from other systems that have more reserves, given bonuses to customers who reduce their water use, and reduced the network pressure to reduce water losses at night. “These measures had an effect equivalent to a rationing operation with a much lower nuisance level to the population,” Bittencourt wrote in an e-mail to Circle of Blue. In the short term, there is little help available to Sao Paulo from other states or the federal government. Cities like Rio de Janeiro are too far away to share water supplies, and Sao Paulo already got tangled in a legal dispute with Rio in August. It was deemed that Sao Paulo violated national water and energy plans when it tried to withhold water that feeds into the Paraiba do Sul River Basin. The Paraiba do Sul is used to supply Rio with drinking water and hydropower. Sao Paulo later released the correct amount of water downstream following an order from Brazil’s National Electric System Operator (ONS). 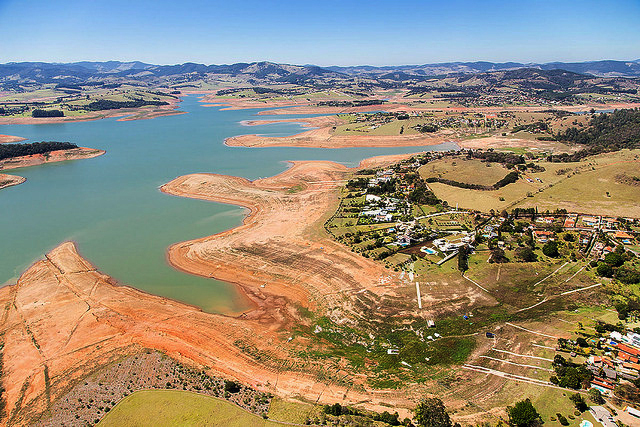 A severe drought has extended across Brazil’s Sao Paulo state for the past year, dramatically drawing down water levels in reservoirs like this one, near Bragança Paulista. Click image to enlarge. Outside factors — primarily deforestation of the Amazon rainforest and climate change — are also stressing Sao Paulo’s water system, according to a new report from a scientist at Brazil’s Earth System Science Center. A draft of the report links a loss of trees in the Amazon to extended dry seasons and droughts across Brazil, the Guardian reported. Trees help to capture water that falls as rain, trapping it in the soil and eventually exhaling it through leaves — a process called evapotranspiration. When trees are cut down to clear the land for agriculture, water that falls on the land washes immediately into streams and river which changes the way that the entire ecosystem functions. Nearly 600,000 hectares (2,300 square miles) of Amazon forest were cut in 2012 and 2013, according to a report released in September by Brazil’s National Institute for Space Research. The rate of deforestation in the Amazon increased by 29 percent during that time period — the first time it had increased since 2008. The Amazon Basin has also experienced two 100-year droughts* within the past decade, a significant indicator of climate change, Castello said. He added that a framework for protecting the function of freshwater ecosystems is missing in Brazil and especially in the Amazon. Most forest preserves in the Amazon, for example, are designed to protect animal biodiversity — not watersheds. While Sao Paulo is not in the Amazon Basin, similar scenarios are playing out in the watersheds that feed the Cantareira reservoirs. Since the 18th century, industrialization and the expansion of cattle ranching has left 70 percent of the land in these headwaters in some state of degradation. They are now the focus of reforestation efforts led by The Nature Conservancy. Though not explicitly linked to deforestation, stream flow rates in the Cantareira system suggest that there is a drying trend that extends beyond the immediate drought — annual inflows to the Cantareira system were below the long-term average 15 of the 17 years between 1997 and 2013. *A 100-year drought is defined as a drought that is the worst drought in the past 100 years. To ensure long-term water supplies, Sao Paulo is relying on two pipeline projects, including one that would take water from the Paraiba do Sul, to augment the city’s supply. The Paraiba do Sul project would siphon 5 cubic meters (1,320 gallons) of water per second from the river into Sao Paulo’s Atibainha Reservoir, part of the Cantareira system. It requires approval from the National Water Agency because the Paraiaba do Sul is shared by three states — Minas Gerais, Rio de Janeiro, and Sao Paulo — and would cost more than $US 200 million, according to local media reports. Construction has already started on another pipeline system that will bring an additional 5 cubic meters (1,320 gallons) of water per second from the São Lourenço River Basin, southeast of Sao Paulo, at a cost of nearly $US 900 million. The São Lourenço pipeline system is expected to be fully operational in 2018, and the Paraiba do Sul pipeline — if approved — will take at least 15 months to complete. Both will help Sao Paulo create a larger buffer between water supply and demand. Currently, the city demands an average of 69 cubic meters (18,230 gallons) of water per second and has the capacity to supply 70.34 cubic meters (18,580 gallons) of water per second, according to Sao Paulo’s Master Plan for Water Resources. By 2035, demand could surpass 82 cubic meters (21,660 gallons) per second, making both demand management and new water-supply sources necessary, the plan says. Taking into account climate change, deforestation, population growth, and the inevitability of another severe drought, Sao Paulo will need to change the way that it thinks about water, according to the University of Sao Paulo’s Monica Porto. Technology that reduces water use and improves efficiency will be especially important, she said, adding that the changes will require more investment. 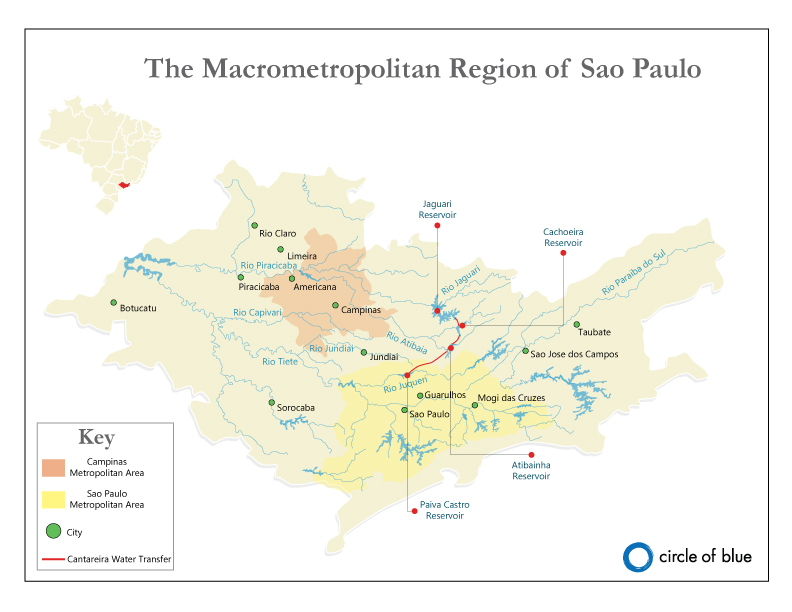 Map: The Cantareira reservoir system transfers water from the Piracicaba, Capivari, and Jundiai river basins to supply the vast metropolitan region of Sao Paulo. This map shows the four main reservoirs that make up the Cantareira system. 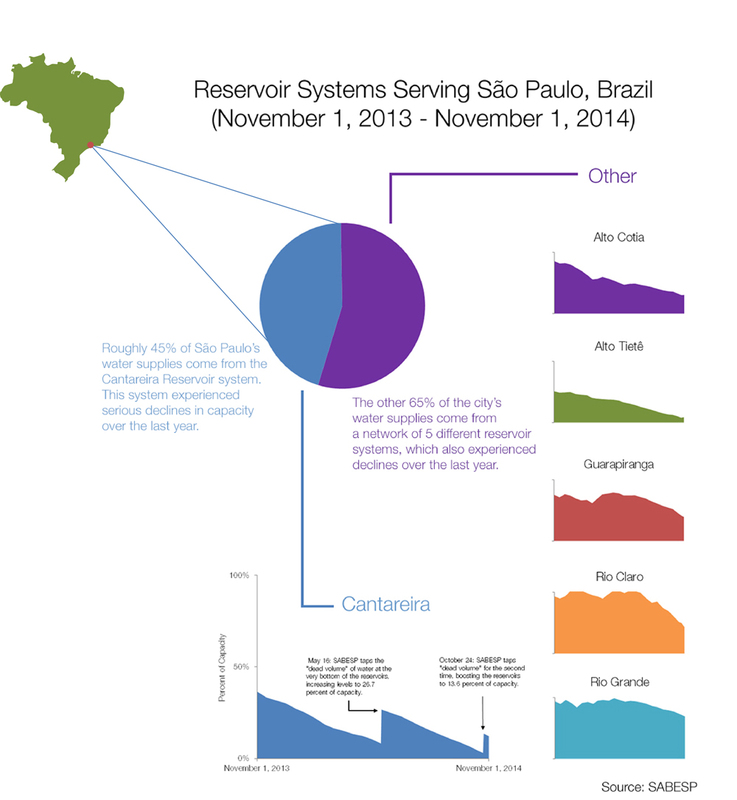 Five other reservoir systems also supply Sao Paulo. Click image to enlarge. city of Winnipeg mb Canada offered to buy with a tax credit, new toilets for your home that were efficient, this would help sao Paulo with out dated homes and update needed infrastructure at the same time!